Horizon Spa Villa offers exclusive, luxurious five star experience in paradise. Taveuni Palms is world-renowned for its exquisite accommodations and facilities, unsurpassed attention to detail and award-winning luxury and service. 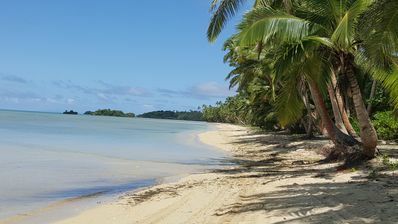 Taveuni Palms is an idyllic South Pacific escape, overlooking glistening crystal waters framed by serene golden sandy beaches. 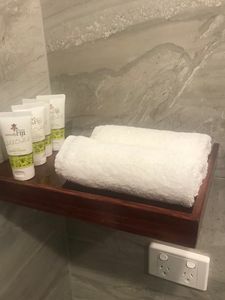 Set on the Fiji garden island of Taveuni, the boutique resort comprises of oceanfront villas, each with a private pool, nestled amongst their own acres of lush tropical gardens, all completely secluded from the other. 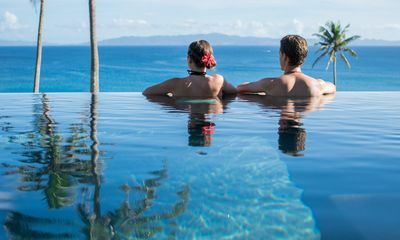 Taveuni Palms strikes the perfect balance, offering the pinnacle in island romance, where honeymooners can enjoy absolute luxury and privacy; and a tropical paradise for families who seek the ultimate island escape, offering a complementary nanny service and a personal staff of seven. 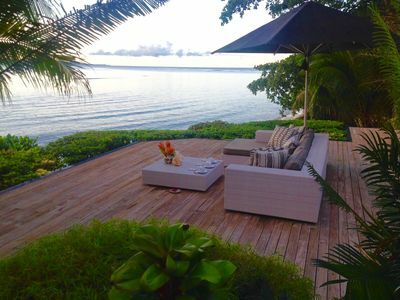 Each luxury villa at Taveuni Palms sits on its own private acre of absolute beachfront and boasts its own private pool, beach and personal staff of seven. Your personal staff is on call to provide you with exquisite food and wine, and indulge you in unsurpassed service and amenities whilst still affording you ultimate privacy throughout your stay. 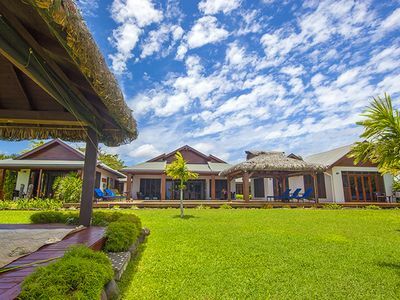 The luxury accommodation offered at Taveuni Palms is like your own private luxury beach house with five star food and service. Adjoining each air-conditioned bedroom with super king beds is a luxurious bathroom complemented by a spacious outdoor shower. Large daybed sofas, hammocks, lofted ceilings with fans and water hyacinth furniture create an ambiance of luxury and comfort. The color palette is deliberately muted with elegant use of soft cream and white hues for the walls, hand polished wooden floors and Italian tiles throughout. 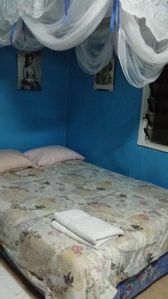 This all contributes to an ambiance of calm restful relaxation within the villa. 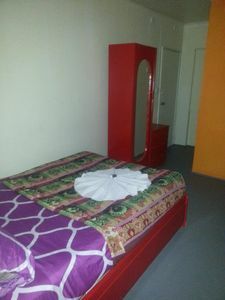 The entire retreat is furbished generously with unique pieces chosen for their comfort, beauty and history. 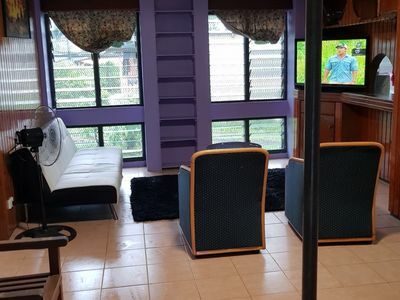 The expansive living areas of the villas boasts an entertainment center, including flat screen TV, DVD, CD player and iPod loaded with 1000 songs with indoor/outdoor speakers. The living area is surrounded by a large decks and outdoor furniture. The villa doors open the entire frontage of the villa to enhance the magnificent views and sea breezes from the deck. 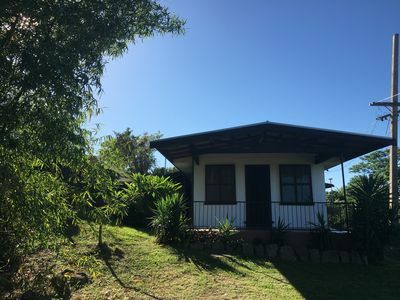 Your days will begin by watching the dolphins swim past through the clear warm waters and your days will end with spectacular sunsets all captured from the decks and pool surrounding your private Fiji villa at Taveuni Palms. 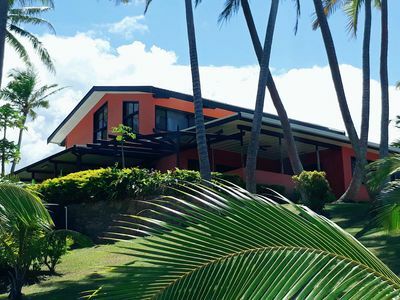 The Beach Villa at Taveuni Palms Resort sits directly on a gorgeous private white sandy beach and is designed to offer couples ultimate privacy throughout their stay. The villa boasts five private dining locations, sweeping gardens to create a feeling of spaciousness and to allow guests to enjoy the beauty of Taveuni’s local flora and fauna, a private swimming pool, wrap around deck giving breathtaking views from the master bedroom, private beach and personal staff of seven. 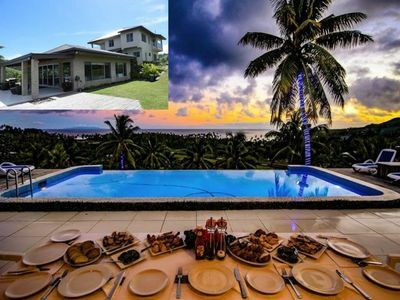 The luxury villa sits slightly elevated above a gorgeous secluded white sand beach with panoramic views of the South Pacific. The living areas of the villa face the sea and the sand delivering exclusive privacy and understated luxury. The villa’s private swimming pool is perfectly positioned by the beach with a thatched day bed overlooking the pool to allow the best views of the turquoise ocean. Large decks, lounging areas surround your pool and villa providing the perfect setting for total relaxation during your luxury Fiji vacation. 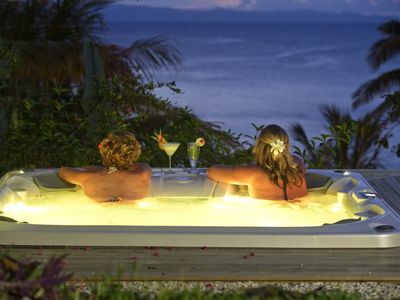 The Horizon Spa Villa at Taveuni Palms Resort sits elevated above the spectacular Pacific Ocean. This villa offers its own private air-conditioned spa bure, cool Italian tiles throughout the villa and a horizon edge infinity pool directly off the villa deck. The villa, setting and amenities are designed to offer couples ultimate privacy throughout their stay. The villa boasts five private dining locations, a private swimming pool, private beach bure, Jacuzzi complete with Bluetooth so that you can play your iPod, large Horizon deck offering breathtaking views and personal staff of seven. 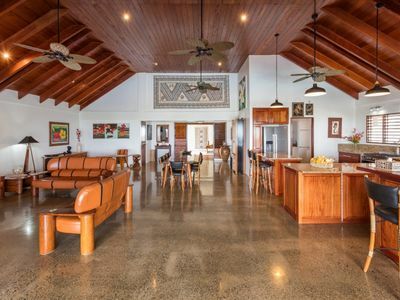 The villa sits elevated above the water with panoramic views of the South Pacific. The living areas of the villa face the sea and the sand delivering exclusive privacy and understated luxury. The private infinity swimming pool sits directly off the villa, perfectly positioned to allow the best views of the turquoise ocean. Large decks and lounges surround your pool providing the perfect setting for total relaxation during your luxury Fiji vacation. Taveuni Island is simply magnificent. We have handpicked the very best island excursions and pride ourselves on using the very best guides on the island. 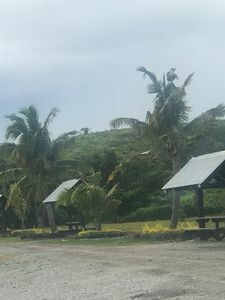 What makes Taveuni Island the best Island in Fiji is the islands natural beauty. The waterways around Taveuni are some of the most beautiful in the world. It is not uncommon to see pods of dolphins, whales and other marine life such as turtles and flying fish during these trips. Whilst the waterways are truly spectacular, the un-spoilt tropical beauty of our virgin rainforest with its incredible diversity will stay with you for life. It’s not uncommon to see red parrots flying through the trees and if you’re lucky enough you will get the chance to spot a rare orange dove. A romantic swim in an idyllic waterfall or an invigorating hike to an incredible lookout point, whatever you choose to do you are guaranteed an experience that will truly take your breath away. Enjoy nights filled with romance and ultimate privacy in your own private beachfront villa. Candle lit dinners on the beach, moonlight swims in your own private pool, twin outdoor showers off your master suite, multiple dining decks, strolling along your own secluded beach at sunset. Book a honeymoon/anniversary at Taveuni Palms and receive a complimentary bottle of champagne upon arrival and a complimentary spa treatment each. 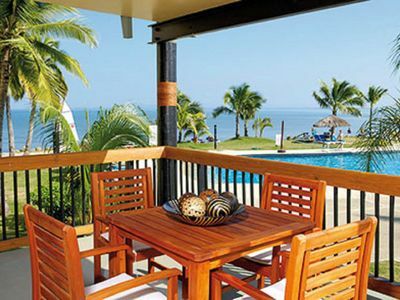 Taveuni Palms is your perfect luxury Fiji honeymoon destination. 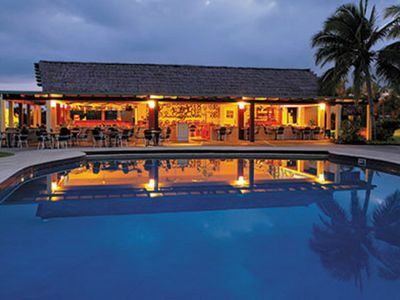 Classy, elegant and unique – Taveuni Palms is one of Fiji’s most sought after luxury honeymoon destinations. 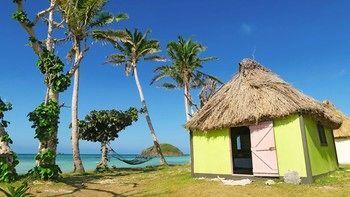 We provide the perfect balance between relaxation and adventure, offering complete privacy for your Fiji honeymoon with the finest in food, service and amenities. Whether you are relaxing by the pool, strolling along your own secluded beach at sunset, or setting out on an adventure for the day, Taveuni Island along with Taveuni Palms is a winning honeymoon combination – come let us pamper you! Your honeymoon should be unforgettable; Taveuni Palms will make sure it is! 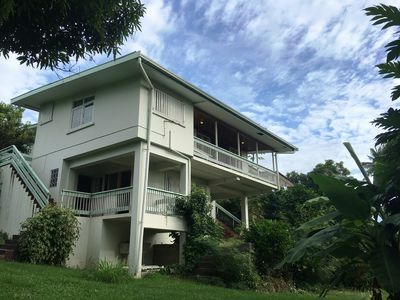 Allow us to help you start your life together in the way life is meant to be lived – Taveuni Palms style. 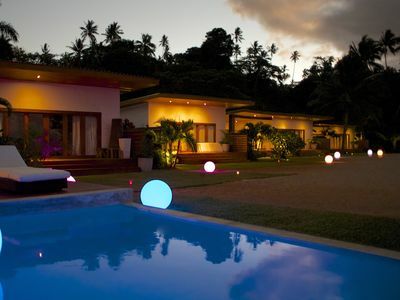 Taveuni Palms Resort offers you five star service in an exclusive private villa.